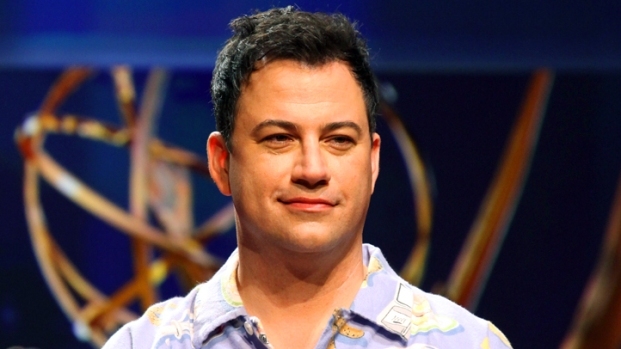 In January, Kimmel goes head-to-head with Jay Leno and David Letterman. "Jimmy Kimmel Live" is moving into the thick of the late-night fight against Jay Leno and David Letterman, ABC said Tuesday, bumping "Nightline" from its longtime perch. Starting in January, Kimmel's talk show will shift from 12:05 a.m. Eastern to the 11:35 p.m. Eastern time slot long held by the news magazine, taking advantage of Kimmel's ratings growth and the potential for greater ad revenue, the network said. "The most exciting thing is having a bigger audience," Kimmel said. "You work all day on the show and you want as many people to see you as possible." "Nightline" will swap places with Kimmel's show, airing at 12:35 a.m. Eastern, and will get a weekly prime-time hour starting in March, ABC said. Jimmy Kimmel had the honor of presenting the nominations for the 64th Primetime Emmys and being a nominee for his show "Jimmy Kimmel Live!" in the Outstanding Variety Series category. Jimmy tries to explain his sleepy outfit and talks about the chances of his show winning. Kimmel's show will move to 11:35 p.m. Eastern on Jan. 8, with "Nightline" starting an hour later on the next night, Jan. 9, and debuting in prime time on March 1. "Given the passionate fan base 'Jimmy Kimmel Live' has built over the past decade, and the show's ratings and creative momentum this season, the time is right to make this move," Anne Sweeney, co-chair, Disney Media Networks and president, Disney/ABC Television Group, said in a statement. "Nightline" has been a strong performer in its 11:35 p.m. slot, averaging 3.9 million viewers to best both NBC's "Tonight Show" with Leno and CBS' "Late Show" with Letterman. But there is more advertiser demand for entertainment programming at that hour, Sweeney said, creating the opportunity for "far greater upside over the long term." What became "Nightline" originated in November 1979 as 15-minute updates on the Iranian hostage crisis airing nightly at 11:30 p.m. Titled "The Iran Crisis — America Held Hostage," this late-night newscast was greeted by many viewers as a welcome alternative to NBC's "Tonight Show Starring Johnny Carson." "'Nightline' has proven its ability to grow over three decades on the air with the show currently enjoying some of its highest ratings and best editorial work ever," Ben Sherwood, president of ABC News, said in a statement. He said the news magazine welcomed the chance to produce a prime-time hour for a new audience and expressed confidence it will "enjoy many successes for years to come." Last season, Letterman averaged 3.22 million viewers; Leno, 3.71 million; "Nightline," 3.89 million; and Kimmel, 1.8 million. The talk-show figures include the second half-hour that includes drowsy audience drop-off.